As the recipient of the 2018 Trustee Emeritus Kenneth Fong/CSU Trustees’ Award for Outstanding Achievement, Stanislaus State senior Livier Camarena Sanchez is one of only 23 students statewide honored with the CSU’s highest recognition of student achievement. She worked hard to earn the prestigious award and, along the way, learned the importance of seizing opportunities, taking initiative and participating fully in her college education. Sanchez is also a second-year Rogers Scholar who maintains a cumulative 3.5 GPA while majoring in biological sciences, minoring in chemistry and working two jobs. 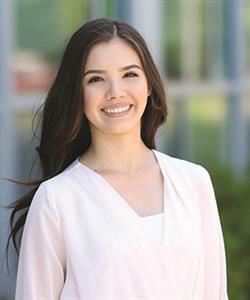 She came to Stan State as a freshman in 2014 and quickly learned the power of asking for opportunities when she realized there was a University Honors Program on campus. Rather than assume she couldn’t participate, she asked questions and did a little homework. That lesson in speaking up was reinforced when, as a sophomore, she learned about a chemistry research project. Encouraged by one of her professors, she talked to the faculty member who was leading the research. Once again, her request for inclusion was met with success and he added her to the team. Other opportunities Sanchez has seized include working on campus in Safety and Risk Management, working two summers at the Kaiser Permanente Medical Center and working as a scribe in the emergency room of Doctors Medical Center. Sanchez plans to graduate in spring 2019 and hopes to attend medical school to become a gynecologist. After witnessing a health emergency in her family several years ago, she has set a goal to provide on-going preventive care to women from underrepresented communities who have barriers to healthcare access. Biological sciences Professor James Youngblom believes Sanchez is on the right path to attend medical school and attain her goals. At her clerical job in Stan State’s Office of Safety and Risk Management, Director Amy Thomas is impressed with Sanchez’s intelligence, consideration of others and passion to care for people. “She has nothing but potential to become what she desires and is exactly the kind of person that Stanislaus State can be proud to say is our student and future alumna,” Thomas said. The oldest of four children and a first-generation college student, Sanchez comes from a tight-knit lower-income family in Keyes. Staying close to family while receiving a quality, affordable education is important to her. Attending Stan State helps her do both. While a student at Central Valley High School in Ceres, Sanchez was accepted to several California colleges, but staying local and living at home while getting a quality education made more sense to her. “This was an opportunity to have the best of both worlds, to stay with my family and also afford college,” she said. The Trustees’ Award will provide Sanchez with a scholarship of at least $6,000. It is awarded each year to one student from each CSU campus who demonstrates superior academic performance, personal accomplishments, community service and financial need. The award named after Trustee Emeritus Keith Fong is awarded to STEM (science, technology, engineering and math) students.